The Fantastic Shakers first performed as the Shakers on September 20, 1978. This year marks the 35th Anniversary. Its going to be a party. I am excited to be working with the Shakers 35th steering committee as we plan and put together the events. I was asked to do the website. 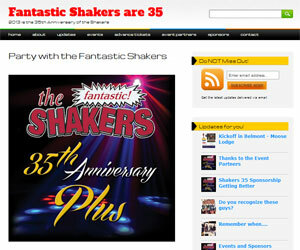 Please visit Shakers35.com and become a sponsor!